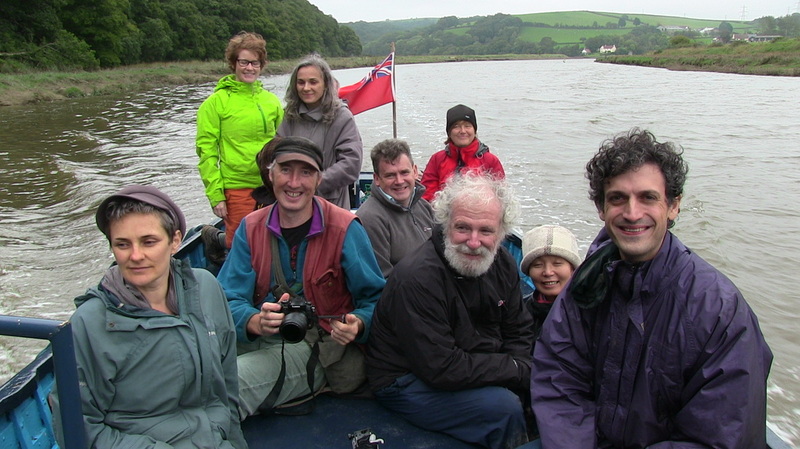 Our fourth workshop took place on the 1st and 2nd of October 2013 based around the River Torridge. It was our final experiential workshop on co-design with non-humans and we wanted to push the concept of participation to its limits by exploring what it might mean to think of a non-sentient 'element' as a possible research partner. We were extremely fortunate to have Owain Jones and Antony Lyons as our workshop co-ordinators, both of whom have already spent a lot of time exploring the agency of water. Our location was chosen in part because of previous work Antony had done on the Torridge and so the workshop was wonderfully informed by networks and conversations he had already been having there. In discussing what kind of participatory approach to adopt, we thought it would be fitting to try out guidelines around conducting ethical community-based research that had recently been published as part of our same AHRC research programme - Connected Communities. We kept these guidelines in mind during our various expeditions and then spend time at the end of the workshop assessing their fit to the kind of frameworks and experiences we encountered over the two days. The workshop opened with an after-dinner presentation from Andy Bell, UNESCO World Biosphere Reserve Co-ordinator, who explained the importance of the Torridge Valley environment and the approach taken to managing the area as an internationally significant biosphere reserve. Questioning the idea of the reserve as an area supposedly segregated from all human interaction, Andy outlined their more flexible approach which incorporates 'transition zones' along with more core areas of focus. Rather than trying to isolate the river from the larger catchment area, the team sought to work collaboratively with communities across the region. With sea level rises and rainfall expected to increase as climate change continues, finding strategies to work in a holistic manner with a transforming water environment were a central concern. Our first full day gave us lots of opportunities to explore the difficulties involved in trying to isolate a body of water from its context which the biosphere team were trying to avoid. In the morning we were joined by Becky Aston from the Devon Wildlife Trust who took us out for our first 'meeting' with our research partner - the Torridge River. Visiting some of the culm grasslands that the Trust helps to protect, we saw how specific hydrologies and geologies combined to create unique habitats for a variety of endangered flora and fauna. We compared our slow and difficult attempts to traverse the boggy, wet pastures with the much drier fields above and noticed how we were already needing to change our embodied inhabitations in our efforts to meet with the river. One of our aims was to locate one of the river's sources, but as we scrabbled over embankments, crawled under fences, leapt from firm patch to firm patch, abandoned particular paths because of burst water mains, we wondered about our desire to 'find the source' and our decisions about which 'water' we were looking for in amongst all the other water we were trying to avoid. Next we drove into Appledore for a lovely (but speedy) lunch at the very obliging Quay restaurant, before racing to meet our skipper Dave Gabe before we missed the high tide. Dave would be taking us from the mouth of the estuary at Appledore up the Torridge as far as we could go. If the morning helped us understand more about the transitional zones between land and river, our afternoon helped us to experience the transition between river and sea. Antony had brought along equipment to test the water's salinity, and so we puttered about in the river, stopping at different intervals to test the intermixing between the salt and fresh water. Noticing the layering of different types of water led us to again question what counted as the river and which 'water 'we were seeking to partner with. Throughout the first day we were struck by the way our focus on water never actually brought us to an experience of 'water' itself, but instead drew us into the complex webs of relationality between the river, the area's geomorphology and the many human and non-human beings that made their lifeways through and with the river. 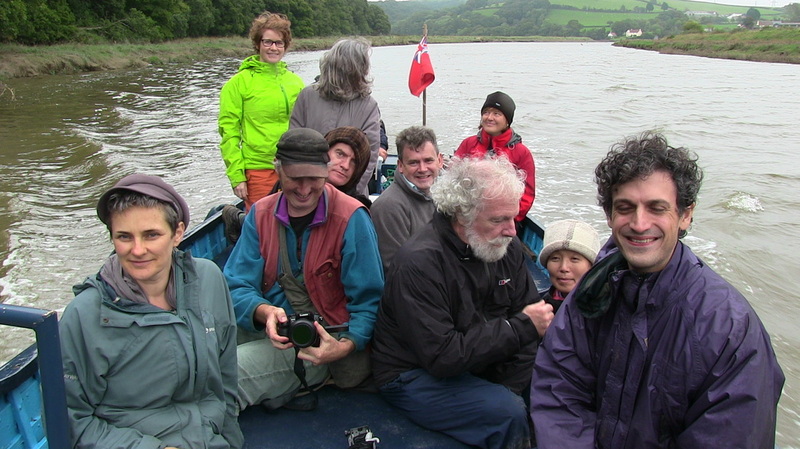 We had learned about freshwater pearl mussels and their relationship with trout and salmon, the butterflies and birds that live only on the culm and saw the rusting boats along the river the Appledore being replaced by water birds and their territories as we moved further up river. Later that evening we heard from Antony as well as Tim Collins and Reiko Goto who shared insights from their collaborative art projects focused on a variety of water issues. After some time reflecting on our experiences from the day before, we spent the morning of day two focused more closely on issues to do with the flow of water and the kinds of control mechanisms that have been used along the Torridge, particularly weirs. We had been hiking through water and travelling on top of it and so now it was time to actually get in. 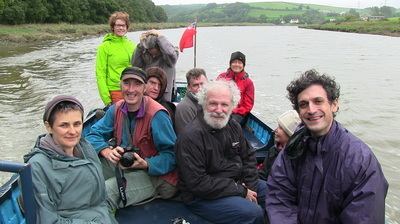 Recommendations from the Biosphere reserve team led us to a wild-swimming site mid-way up the Torridge near a pedestrianised bridge. Wetsuits, bathers and waders allowed us to experience this part of the river for ourselves, noticing the changes in flow as the water moved toward and under the bridge, and the changes in ourselves as we relaxed into the water. After a poetry recital and a brilliant game of pooh-sticks (to help us further understand flow) we headed on to our final session of the day at the RHS gardens at Rosemoor. Sharing and Learning from the Research. The first group worked on the project Inventory of language ascribing agency to the river which picked up on the wide-range of ways we had heard people talking about the river as an active force. They explored how a better understanding of the way people are already talking about the river, and the way this changed as people moved in and out of 'official' or 'scientific' contexts, might shed light on how water might already be considered as a participant in people's everyday experiences. They focused on the ethical issues that arise during preparing and planning such as understanding why different partners might want to work together in the first place, making sure that participants reflect the range of perspectives and experiences that affect an issue and developing a shared understanding of the project's aim and objectives. The second group worked on a project they titled Watery Everyday Engagements and focused on the ethical issues that can arise while doing the research which included developing guidelines for how participants will work together and how researchers will handle information and treat those who provide it. While the third group worked on the project Flows: What is natural? which was inspired by our morning session. This group focused on the ethical issues that arise when sharing and learning from the research including how data should be analysed and interpreted, how to disseminate the work, how to acknowledge authorship and credit, and how to implement and learn from the research. A whole range of issues came up which we are still digesting and analysing. For most people the attempt to understand 'water' as a separate participant, outside of its context was a problem. Instead people moved towards thinking of the research partner in terms of the specific river and even further that our 'partner' needed to be understood in terms of the wider water-shed understood as a social-ecological community. Language was another central issue with a range of discussions around how to understand communication in broader ways, including in more embodied, material and physical ways. Specific ethical issues around permission, confidentiality and inclusiveness, which are hard enough in human contexts, often seemed to implode at first when looked at from our context, although some came back together again in reformulated ways. Can you ask water for permission? Does this assume a specific fixed entity rather than a ubiquitous system? Perhaps permission issues should be thought of a working from an ethic of flourishing for all involved? And what about confidentiality? Is there anything that the river might tell us that we shouldn't share? We could definitely think of issues related to humans that came up in our visits that shouldn't be, but what about things like the data from the salinity testing? When doing analysis, what would it mean to keep the river seriously in mind as well as the communities that are part of its webs of relationality? What role is there for imagination and empathy? And particularly what might the arts and humanities bring to the conversation? Finally we were struck by the seeming incommensurability of the questions we were asking of ourselves and wondered what to make of the linguistic friction we were encountering. Thanks to Andy, Becky and Dave for being so generous with their time and knowledge, to the Yeolden House Hotel for hosting us in amazing surrounds and to Antony and Owain for organising the workshop.